I hope your year is going well! As the second semester of the year is starting, teachers across the state are working diligently to prepare our students for state testing. Most teachers are aware of the changes underway. If you would like more information on the Spring 2019 New Mexico Standards-Based Transtion Assessment of Math and ELA, including pre-recorded webinars, blueprints, and performance level descriptors, please visit the PED Website. 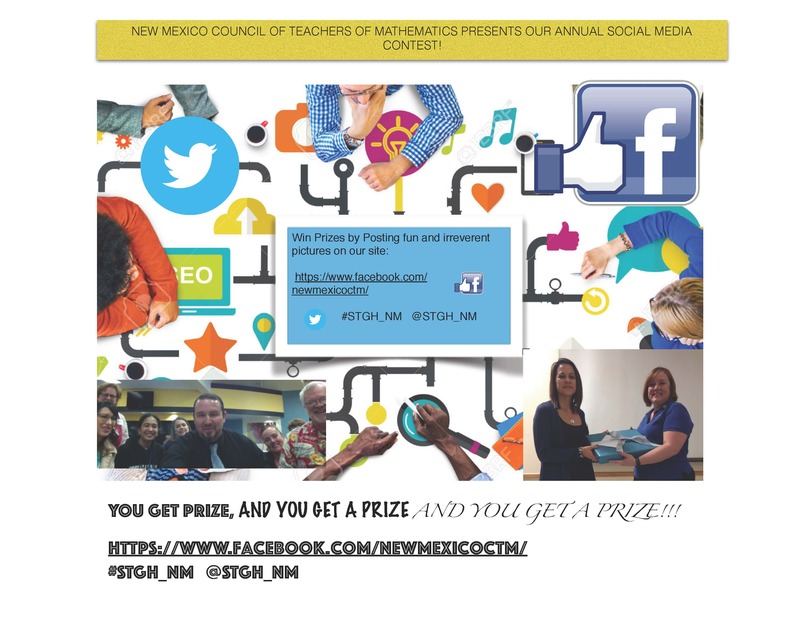 In an effort to provide NM math teachers with timely help, we have started a Facebook Group. Our goals is to provide a place where we can ask questions about math, programs, students and more and get answers that reflect the values of our teachers. To join, go to the New Mexico Council of Teachers of Mathematics page, click on groups, then click join. We would love for you to post your questions and chime in with answers. As the legislative session continues, we will keep an eye on NM House Bill 5 and 212. These bills focus on public education changes and the teacher evaluation system. Their outcomes will have an effects on all educators. We will be sure to update you on what those changes mean to you. If you want to read through them for yourself, visit the NM Legislature website. If you would like to become a part of our executive committee, please send me an email. We currently have the President Elect position open. At present, we are reviewing an application for the NE Regional Representative. Privilege of participating in Affiliates Leadership Conference to share with other State leaders about methods of improving National and NM math education. Here is the complete list of NCTM Affiliate Benefits. If you have not registered nationally, we encourage you to do so here: NCTM registration. Postitions & Standards that guide many of our most widely implemented National, State, and district initiatives. In addition to these larger offerings, the NMCTM has a NM Math Educators Google Group / Listserv that you can sign up for and send and receive to other educators across the State. Anyone can post to the list, however, if you are a full dues paying member you can post directly to the NMCTM Blog which will automatically post to our Listserv, Twitter, and Facebook (#nmctm @nmctm). We are also piloting a mathematics NMCTM Wiki to store lessons and pedagogical strategies. We are looking for members to volunteer to be professional development gnomes, who will post 5-10 items per month to our digital infrastructure that are germane to NM math educators in some fashion. Email us if you are interested. Intermediate technology experience required. If you never received your NMCTM certificate, please fill our Membership Certificate Form. So, now that you are convinced of what we have to offer and excited about our latest news, please go and renew your dues at our membership corner! You will need to create an account with our website in order to do this and if you need help with that or encounter password recovery trouble, please email us. In the meantime, please consider volunteering yourself or nominating another for one of our positions in the next calendar year. We are always accepting applications! Happy belated New Year. We will be holding a Board Meeting this Saturday, February 2nd. If you are in the general membership and/or public, and desire to attend, please email the Communications Specialist for access to the meeting. A reminder that Bootstrapworld.org, an organization that has been monumental in leveraging programming and code to support explicit mathematics instruction, is visiting NM June 4th through the 6th. This training is part of the greater CS PD Week that CSTANM is hosting and is tied to National efforts that emphasize the same outcomes and skills. Those interested in NCTM National’s policy toward CS infusion into mathematics pedagogy should review this Position Paper. 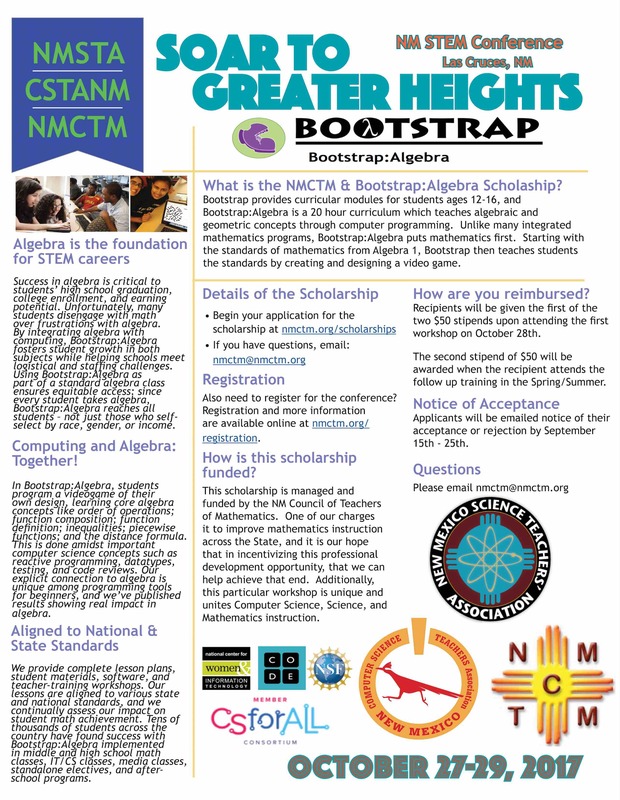 The NMCTM would like to remind folks that Bootstrapworld.org visited us at last year’s Soar to Greater Heights Annual STEM Symposium Conference that NMSTA, NMCTM, and CSTANM co-hosted, and is now returning to do more work with NM educators this summer! This session is invaluable and we are encouraged by the numbers of folks signed up already. For those who missed this session, please email president@nmctm.org for more information on how to get involved in teaching math with CS instead of just passing students and sending them to alternative courses. We strongly endorse this training, and are proud to be its formal sponsors, and look forward to meeting and working with constituents in ABQ at the training. If somehow the CS PD Week missed you, please visit CS PD Week, and we strongly encourage you to reach out to our partners at CSTANM. We are proud at NMCTM to sponsor this training and want to know from you, our membership, how we can continue to support you in leadership efforts across the State! Reach out to us! 1) The NMCTM has multiple presenters at the session – please visit and ask questions or get involved. 2) Our Annual Meeting and elections have been formally moved to the Symposium for this school-year, and potentially others, so see everyone at the pull out! Also, the NMCTM is proud to announce the formation of the Dr. Kinzer Math Teacher Professional Development Endowment this year. By investing in the future of teacher PD, the NMCTM continues to position itself in ways that can directly benefit educators for trainings, workshops, webinars, travel reimbursement, study sessions, and more. Interested parties should email treasurer@nmctm.org. The endowment was created with the assistance and stewardship of the private fiduciary Longview Asset Management, located in Santa Fe. Thanks again for finishing a great year of teaching and service! See everyone soon. The NMCTM website is currently undergoing maintenance and updates. Please be patient with us while we ensure that our content and user data are secure. I would like to introduce myself as the new president of NMCTM. I have been the Central Region Representative for the past 2 years and look forward to working with you in this new capacity! At our Annual Meeting, which was held at the Soar to Greater Heights Conference in October, we gained some new members and said hello to familiar faces. The committee put a lot of time into planning the event and we are glad that it was a great experience for you all! If you would like to become more involved with NMCTM, we have an opening for Central and Northeast Region Representatives as well as President Elect. NMCTM also has a NM Math Educators Google Group / Listserv that you can sign up for. This will allow you to and send and receive important information relative to our work as well as invitations to Math related offerings in the state. Anyone can post to the list, however, if you are a full dues paying member you can post directly to the NMCTM Blog which will automatically post to our Listserv, Twitter, and Facebook (#nmctm @nmctm). I know spending money on professional organizations is not at the top your to-do list, but if you have not renewed your dues with NMCTM, please do so at our membership corner! You may need to create an account on our website. This allows you to post on the website as well as pay your dues online. In the meantime, please consider volunteering yourself or nominating another for one of our positions in the next calendar year. We are always accepting applications! The establishment of and job duties for these roles can be found in our By-Laws and Constitution. We would like to thank you for your dedication to New Mexico students. Math education is a necessity and you are making it happen! It takes hard work every day to help these students achieve, and we are all doing it! Your commitment to your students and our profession is fundamental to our organization and we commend your work! Thanks for all your hard work in making 2017 a huge success. Membership is at our highest numbers in the last decade, our financial situation is secure, and we continue to offer regional grants and positions for educational leaders. Email treasurer@nmctm.org for more information. Our new President, Tammy Hernandez, will be reaching out soon to the membership for some feedback on this year’s professional development offerings and more. Please visit in the next week or so to catch the official 2018 President’s Update. We are proud to introduce Dr. Bill Gutman as our keynote speaker during Saturday’s sessions at this year’s – #STGH_NM – STEM Conference, Soar to Greater Heights 2017. The conference will be held at Las Cruces High School October 27th – 29th. Dr. Gutman will deliver the keynote just after the luncheon on Saturday, from 12:30pm – 01:30pm. Dr. Gutman’s bio is included below, and more information on the schedule of events can be found at the Event Schedule and General Information Page. “Dr. Bill Gutman has been the Director of Aerospace Operations for Spaceport America since October 2009, although his deep involvement with the project goes back to the mid 1990s through a technical support contract with New Mexico State University. As Director of Aerospace Operations, his major responsibilities are to oversee launches and flight safety, to maintain the FAA Launch Site Operator License, and to be the technical liaison with launch customers. He also has the honor and privilege of being the face of Spaceport America’s STEM outreach program. In that capacity, he tries and frequently succeeds at exciting the upcoming generation about STEM careers. He presents space demonstrations and videos to every sixth grade science class in the Las Cruces Public Schools as well as to many other school groups around New Mexico using both in-person and virtual methods. What is Bootstrap:Algebra and Bootstrapworld.org? And when / if one digs deeper into the guiding philosophy of Bootstrap, they will find that students are explicitly taught math standards using tools drawn from computer science, design, and other subjects. All too often, this paradigm is switched, with math teachers typically being asked to augment or support instruction in other fields, while this approach does the exact opposite. Bootstrap uses other fields, notably computer science and one of its most demanding branches, programming, in order to augment mathematics pedagogy (not the other way around). This paradigm switch is a necessary development as the country matures into the realization that computer science has essentially become a new subject alongside the four traditional content areas. Finding meaningful ways to transfer skills and conceptual learning in both directions is essential, and Emmanuel Schanzer and Bootstrap provide the balance that is essential for any institution to implement an engaging and helpful mathematics program. How does this scholarship and workshop help me as an educator? This workshop will introduce educators to programming that supports Algebra 1, to representing mathematics in different ways, notably the concept of circles of understanding that Schanzer developed. Educators will leave with a basic overview of how they can support students in Algebra 1 by engaging them in a meaningful design and game design lesson. Yes, please contact Tammy thernandez@nvanm.org if you have not received your certificate after two weeks from the completion of the conference. You will receive your certificate of attendance if you were accepted and awarded the scholarship. All applicants must possess a current NM Teaching License. How does it work and when do I get the reimbursement? Educators who are awarded the scholarship will receive two disbursements of funds, i.e., one at the first workshop this fall and then the second reimbursement at the required follow up conference late in the Spring of 2018 (info TBA). Teachers or districts may also optionally choose to allocate the scholarship to the conference registration costs if that is more fitting. What is taught at the workshop and what is the value of this workshop? The workshop will briefly cover the concepts of transfer, circles of influence, implementation of the Bootstrap:Algebra curriculum, familiarity and help with the platform and Pyret programming language. Bootstrap normally meets with educators for intensives that last 3 days and cost nearly $600 for educators. The NMCTM and Bootstrap, recognizing the limited budgets and urban / rural divide in NM, have partnered to make this training a Deep Dive half-day session that is not only free for NM educators, but incentivized through a scholarship. NM educators will be paid $50 after attending the first workshop, and $50 after the attending the second workshop in Spring / Summer. Who is teaching the workshop? The founder and CEO of Bootstrap, Emmanuel Schanzer. How do I sign up for the scholarship? Below, please find a one-page flier that can be forwarded to your district officials, evaluators, colleagues, etc. Spread the word! Soar to Greater Heights is the fall STEM educator conference sponsored jointly by the New Mexico Science Teachers Association, the Computer Science Teachers of America New Mexico and the New Mexico Council of Teachers of Mathematics. The conference’s location moves throughout the state in order to serve all of New Mexico’s educators. This year’s conference is in Las Cruces, hosted at the newly renovated Las Cruces High School. The conference dates are October 27-29. The conference components include workshops and presentations for math, science, and computer science educators; exhibits from commercial vendors, nonproﬁt organizations, parks, outreach programs, and universities; social time; and extended learning opportunities and ﬁeld trips. Registration links and payment options for exhibitors, presenters, and attendees are listed below. We look forward to your participation and another year of meaningful presentations that improve pedagogical practice and student learning. Early Bird rates only $85 … PED Scholarships still available! 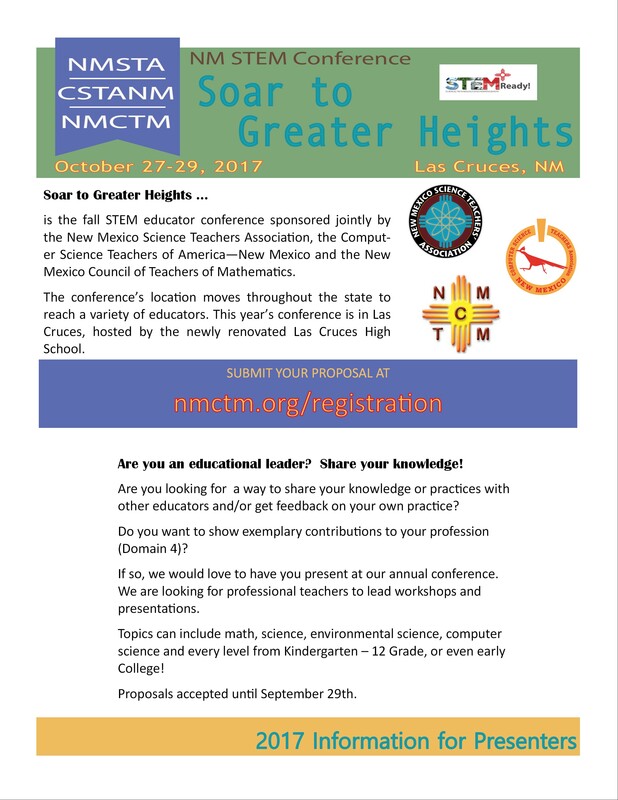 We are proud to announce that this year’s Soar to Greater Heights annual STEM Conference for NM will be in Las Cruces, at Las Cruces High School from October 27th through October 29th. Registration information here! 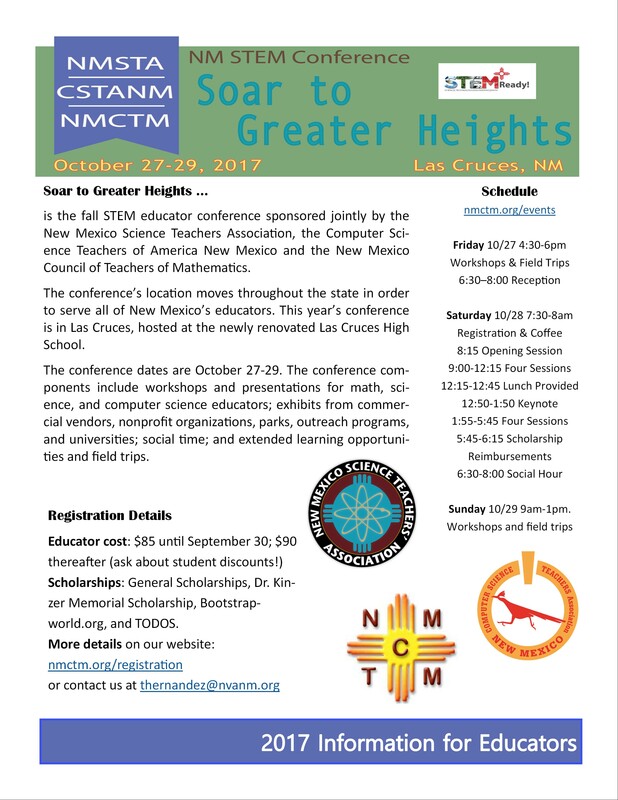 This year the conference is brought to you by New Mexico Science Teacher’s Association, New Mexico Council of Teachers of Mathematics, and the Computer Science Teachers of America – New Mexico. We are proud partners in STEM in NM! First off, thanks to all NM Math Teachers and the larger teaching community. There is much going on in NMCTM-Land this Spring. Most importantly, we finally filled the position of NCTM Representative that was left empty with Dr. Cathy Kinzer’s untimely passing. We would like to formally welcome Ronda Davis, Math Specialist for Albuquerque Public Schools, B.A. Chemistry & Biology, M.A. Mathematics Education, National Board Certified AYA Mathematics, T^3 Regional Instructor, and much more that we can’t adequately express in words here. It is with great pleasure that we welcome Ronda to the team. Her complete resume can be found here. Financial rebates on membership (contact NCTM). A complete list of Affiliate Benefits can be found here (not all of which are actively used in NM). In addition to what NCTM provides NMCTM as an affiliate organization, we must remind our membership of what NMCTM provides you as an individual math teacher. Firstly, the NMTeach Domains can be found here (1, 2, 3, 4). In looking at NMTeach Domain 4b, Participating in a professional community, it can be seen that teachers are awarded exemplary if “The teacher is actively engaging in ongoing research, leads study groups, and identifies new practices for school and district implementation: Teacher serves as an instructional leader, and is accepted by faculty for exceptional skills in delivering professional development and mentorship.” Each year the NMCTM offers an annual conference, Soar to Greater Heights, with multiple STEM workshops, with pre- and post-conference service and field learning trips, and more importantly, with time for educational dialogue with educators across the State. The exemplary category specifically calls for research and district-level implementation; working with partners at the State and National levels with NMCTM is a strong component towards achieving this end. Exhibitors can look at last year’s statistics here. NMTeach Domain 4di, on the other hand, Demonstrating Professionalism: How high are the teacher’s professional standards and practices? is rated exemplary if “The teacher proactively and in a positive way seeks to continually improve the culture of the school by consistently raising expectations for adults and students, raising the engagement of adults and students and contributing to the efficacy of adults and students.” In order to offer our districts the ‘highest’ in these standards and practices, it seems very likely that math educators would be compelled to reach out to State and National educators in mathematics. As President, I certainly cannot do it alone, and I find the NMCTM is part of the bridge between these communities. In addition to these larger offerings, the NMCTM has a NM Math Educators Google Group / Listserv that you can sign up for and send and receive to other educators across the State. Anyone can post to the list, however, if you are a full dues paying member you can post directly to the NMCTM Blog which will automatically post to our Listserv, Twitter, and Facebook (#nmctm @nmctm). We are looking for members to volunteer to be professional development gnomes, who will post 5-10 items per month to our digital infrastructure that are germane to NM math educators in some fashion. Email us if you are interested. Intermediate technology experience required. If you never received your NMCTM certificate, please fill our Membership Certificate Form. The establishment of and job duties for these roles can be found in our By-Laws and Constitution. Lastly, we are abundantly aware of the sacrifice that math teachers make every day balancing droves of content with a shrinking schedule, never ending excuses for lost instructional days, and a master schedule that never seems to be right for math! In addition to the day to day grind, we all have to find some type of professional peace with our district, State, and National initiatives. Committing oneself to leadership at this level is a means of confronting this difficult necessity directly. Help us in the fight folks! Join NMCTM or renew today! More posts coming soon about our Wiki, our upcoming conference, our findings from NCTM National, and our sponsored booths and annual meeting at the NM PED’s STEM Symposium this summer (last year’s information)! We posted the links below in October at our Annual Conference. We have had limited applicants, and so we are sending this out again to ensure that we have buy-in from our community. Remember, these positions help you meet elements in Domain 4. Furthermore, being an instructional steward for your community is its own reward. Please email president@nmctm.org if you have questions. Our staff directory lists our open and occupied positions and can be found here. It is that time of year again! Annual elections for Regional Representatives, Treasurer, and President Elect up again! Please use the links below to apply for your desired position. Please forward these applications to any at large members that you feel might be appropriate for these duties. Soar to Greater Heights 2016 – Social Media Splash! You can also post directly to Facebook at facebook.com/newmexicoctm … Let’s have fun while geek out on STEM! Remember, even though you are having fun in this contest, you are also helping yourself achieve higher scores in Domain 4 … so make sure your dues are paid up while you are having fun splashing STEM photos everywhere! But more importantly, we would like to remind our constituency of the passing of Dr. Kinzer – long time advocate of PD for math educators in NM and Board Member – and our subsequent decision to enact an annual scholarship in her honor. The scholarship is $100 and the requirement is attending the conference in full. Applicants are required to answer the application questions linked to below. (Remember to register a teacher account with the NMSTA website first, then follow the registration process through. Looking to build up that curriculum vitae? Keep trying to hit Exemplary in Domain 4e and 4b, but falling short? A great way to become a better educator and get recognized in the community for it is to share the pedagogies and techniques that are working for you! 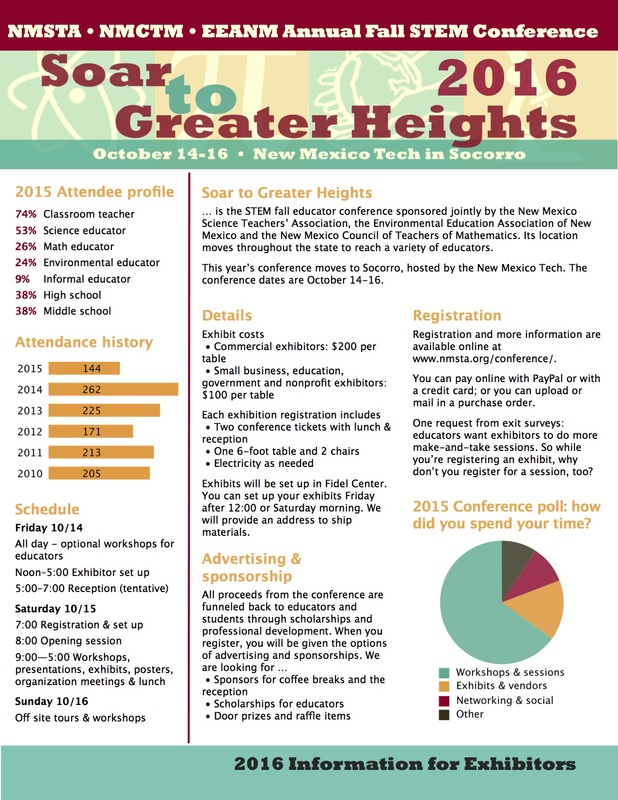 From October 14-16, in Soccorro NM, we are proud to co-host the Soar to Greater Heights Conference. Maybe this year it is time for you to not only attend the awesome course offerings as an attendee, but to build up your resume and vitae by sharing your ideas. Please visit the Proposal Registration site with our partners over at NMSTA, and don’t forget to Save the Date! It is hard to believe that summer is already here and that we are only five months away from our annual conference, Soar to Greater Heights, which takes place October 14-16 at NM Tech in Soccorro, NM. Registration for attendees is slated to open August 1st so stay tuned and make sure to check back on the website and listserv for when that opens. If you have any follow up questions, please do not hesitate to reach out to NMCTM. 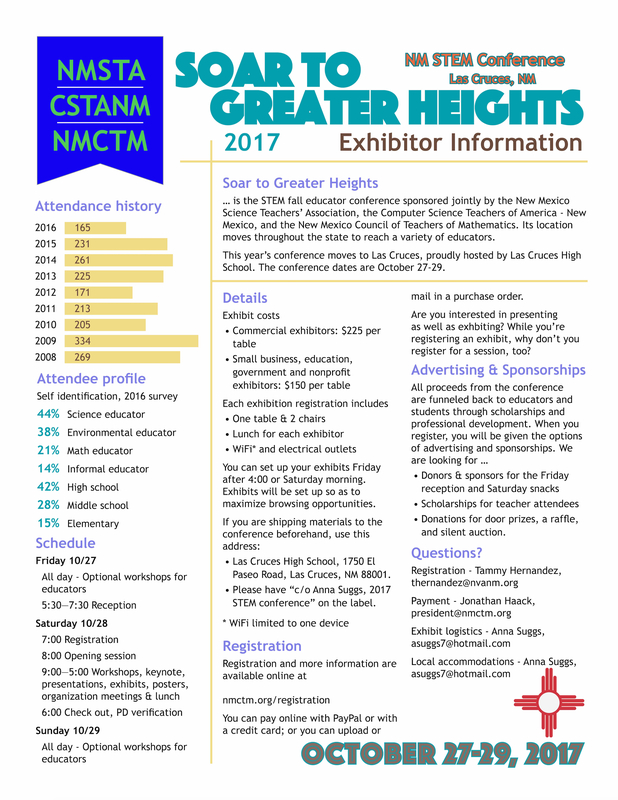 The NMCTM is proud to co-host a booth with the NMSTA at the NM Public Education Department’s 3rd Annual STEM Symposium. Please visit our booth to inquire about our upcoming conference Soar to Greater Heights, hosted at NM Tech October 14-16. Additionally, we encourage everyone to renew their dues this year which will assist you in Domain 4 with your annual evaluation. The Soar to Greater Heights Annual Conference is right around the corner so Save the Date! 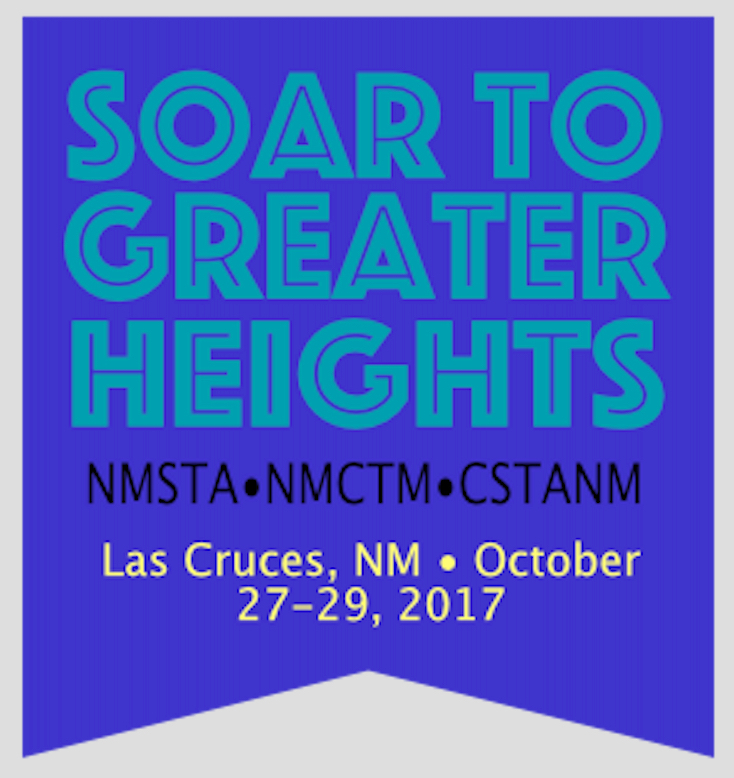 This October 14-16 we will be co-hosting our annual conference at NM Tech this year with the continued support of the NMSTA and EEANM. At this time, we are accepting Exhibitor Registrations only, and those parties are encouraged to apply at the following registration link. Please be advised that this link will take you to the NMSTA website, where you might have to first create an account prior to submitting your application. 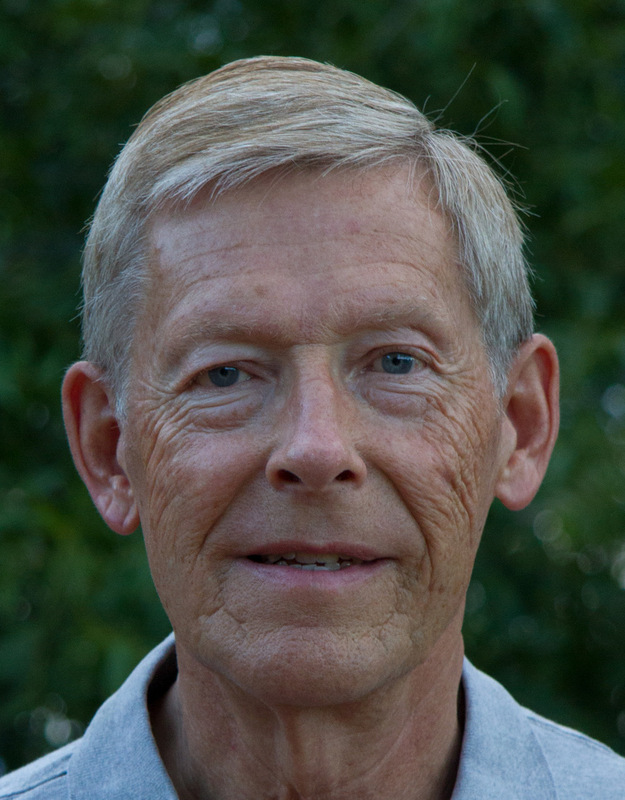 It is with great sadness that the NMCTM reports that Dr. Kinzer, a long serving Executive Committee Member of the NMCTM and representative of the NCTM member affiliate program, passed away in a car accident in late February. Our condolences are with her family during this very difficult time. To honor her years of service in the educational community, the NMCTM Board has unanimously voted that the annual scholarship for Soar to Greater Heights Conference be hereafter named in her honor. From this point forward, the scholarship will be known as the Dr. Kinzer Annual Memorial Scholarship. It is our hope that this scholarship will continue to inspire future generations of educators with the story and legacy of her service, and serve as a model of how to give back to the educational community in NM and abroad. First of all, happy new year to all the teachers out there, especially our NM Math teachers who struggle to balance curriculum with high stakes testing, evaluations, and an ever changing digital pedagogical environment. Thanks for the work all of you do. I know in my own district and at my own sites, that it is my family of teachers that empowers me to finish the year off with strength and energy. I’m sure you will also be resting on the shoulders of your peers and fellow teachers, collaborating and sharing stories of success, finding ways to increase achievement, and enjoying the students. With each other, we can continue to succeed. I would also like to call out on fellow math educators across the state, both current and retired, whether from a math background specifically, or from another STEM position, to reach out to the NMCTM and tell us how we can best serve you. The teaching environment is ever changing, and I call on all of you for help in developing a comprehensive Mathematics Vision for NM Students to help all of our students in NM learn mathematics in the most effective way possible. I will advocate for you as teachers and for the students as our shared body of learners, but I ask in return that you join in on the discussion with us, apply for membership, apply for leadership roles within the organization, contribute to the math dialogue by posting to our blog and listserv. Share the stories from your community with others across the state, borrow and contribute lesson plans to the upcoming wiki, post events, competitions, workshops, etc., etc. And although your contribution fulfills NM Teach 4B, remember our task is even larger than that. Our task is student learning. Remember, as members you have user privileges that allow you to post exciting news about mathematics opportunities within the state directly to the blog. Or you can also sign up for our public listserv, and send and share opportunities to nm-math@googlegroups.com. Contact webmaster@nmctm.org if you have any trouble or have questions. Welcome back to another wonderful school year. I hope you are all as excited as I am. Last year was full of changes, and we weathered every storm and continually worked to meet the needs of our students. We hope that you are enjoying the new website and Social Media feeds. As a council we are doing our best to reach out and network with math teachers across the state. Thank you for all that you do every day. As we are ending this school year NMCTM would like to thank all of you for your hard work and perseverance as we learned new systems, rolled out new tests, and kept doing what we love to do everyday, helping students to learn. We hope that as time goes on and we continue to build resources on our new website, that you will find more and more useful information and build collaborative relationships within our organization. NMCTM is always looking for people to become more involved in the organization and to help us build. Feel free to email us ideas and comments, talk to your regional representatives, or join us as an active member of the organization. Thank you again for all that you do for the students in New Mexico. 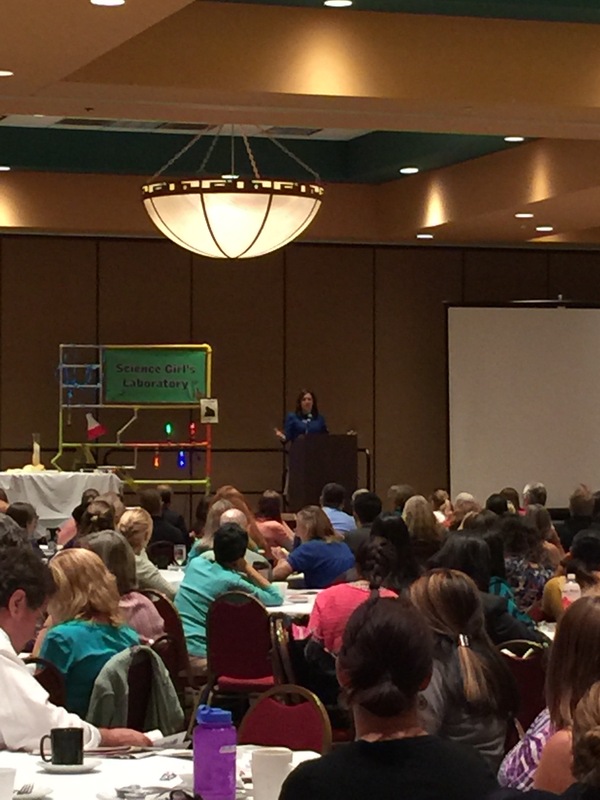 This is an exciting time for math teachers in New Mexico. We have been gearing up since the implementation of Common Core standards and at the start of next month all school districts across the state will embark on a new type of testing. As the President of NMCTM I hope that this will show the hard work that educators across New Mexico have put into preparing our students. This is a work in progress so please be patient as we work out all the glitches. We are extremely happy to offer this to you and hope that you will be equally as pleased with our efforts. These changes are part of a greater website redevelopment effort by the NMCTM … please visit www.nmctm.org where you can now create accounts on our website, and pay dues annually online … member only benefits such as creative WikiSpaces coming soon so we can share PARCC and CCSS resources, etc. If you have any difficulties using the above links, please email me at oemb1905@nmctm.org. Please allow 24-48 hours for approval and assistance as I will busy at the conference this weekend. You have three months to complete the migration to the new listserv after which point it will be deleted. Thanks for understanding and thanks to Sheila Hills for her patience during this migration. Enter your email address to subscribe to NMCTM and receive notifications of new posts by email.